Detailed review of Vitamin Bounty Pro-25. See how this probiotic supplement compares against all the others! 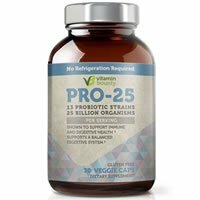 Overall, at 2.5 out of 5 stars, Vitamin Bounty Pro-25 is an average probiotic. I like that it’s pretty convenient and easy to take. You simply take 1 capsule daily with water, on an empty stomach or between meals. The capsules weren’t hard to get down. You also don’t have to refrigerate the bottle, so that’s a plus! I like that the capsules are gluten free and safe for lacto-vegetarians. Vitamin Bounty Pro-25 uses a delayed release formula that helps make sure the probiotics can make it into your intestinal tract. This probiotic also has fermented wheat grasses added, which isn’t something I’ve seen a lot of. Since there are added wheat grasses, it makes it not allergy friendly for a lot of people. These capsules contain MILK, SOY, and WHEAT. That’s a huge bummer because so many people are allergic to these. This probiotic also goes WAY overboard with the amount of probiotic strains used and even the cell count. 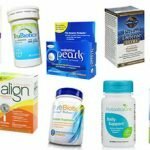 When too many are used, it can actually lead to bad side effects and the probiotics can begin to cancel each other out. Also, speaking of side effects, I definitely saw some belly pain and bloating while taking these. This probiotic also isn’t safe for kids and is intended for adults only. Overall, at 2.5 out of 5 stars, Vitamin Bounty Pro-25 is an average probiotic because it doesn’t have to be refrigerated, it’s gluten free, and uses a delayed release system but it’s expensive, isn’t allergy friendly, and goes way overboard with cells and strains. 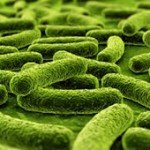 Vitamin Bounty Pro-25 contains 25 billion cells in 13 probiotic strains. Of note, I like the use of Lactobacillus acidophilus in the probiotic lineup. It’s one of my favorite strains and been researched quite extensively. Lactobacillus acidophilus has been shown to potentially relieve the symptoms from Irritable Bowel Syndrome (IBS), Crohn’s disease, and gut dysbiosis. Lactobacillus acidophilus may also help treat yeast infections, boost immune function, and decrease the frequency of urinary tract infections (UTIs). One strain I’m not a big fan of is Lactobacillus casei. L. Casei is very aggressive and can overrun other “good” probiotics, occupying areas that other probiotics might have taken in the body. We definitely don’t want that! Vitamin Bounty Pro-25 is NOT allergy friendly. This probiotic contains allergens that are known to cause people a lot of problems. Vitamin Bounty Pro-25 contains WHEAT, MILK, and SOY. If you’re allergic to any of those, please steer clear of this probiotic. This probiotic contains fermented greens including barley grass, oat grass, wheat grass, and alfalfa. Other ingredients include: cellulose (from capsule), cellulose powder, magnesium stearate (vegetable source) and silica. When you break it down, it works out to $0.99 a day to take these. That’s really expensive and I honestly don’t think it’s worth the high price tag. In my opinion, this probiotic isn’t a good value for the price. I definitely saw some negative side effects while taking Vitamin Bounty Pro-25. 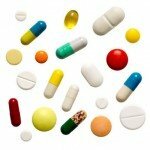 I think the use of so many probiotic strains and cells definitely lead to the bad side effects. Please keep this in mind, especially if you have a sensitive stomach. This product isn’t meant for a daily use, but more as a supplement for a specific ailment. Unfortunately, I couldn’t find any sort of satisfaction guarantee for Vitamin Bounty Pro-25. 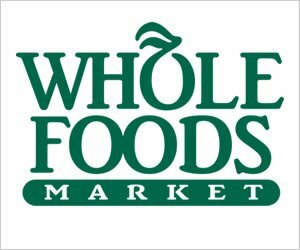 I searched their website and was confused because there just seems to be a lack of information overall. The FAQ page was also randomly not in English, however the rest of the site was. I was bummed that I couldn’t find any type of guarantee or even a return policy. To buy Vitamin Bounty Pro-25, click here.